Hongneung is a quaint neighborhood in northeastern Seoul, situated near several universities and research institutes. In this area stands an organization working toward an ambitious national goal that goes beyond academia — pioneering a successful biotechnology cluster in South Korea. Meet Seoul Bio Hub, established by the Seoul Metropolitan Government and operated and managed by the state-run Korea Health Industry Development Institute. The body is steering the municipality’s efforts to build a biotech cluster recognized by the global community. 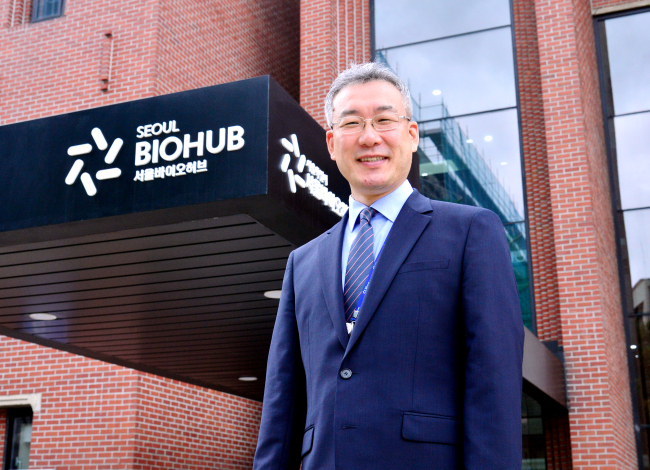 Seoul Bio Hub opened its doors in October 2017, as an organization to provide early-stage biohealth startups with the resources and support they need to develop their business and tap into global markets. In addition to this role, the hub is spearheading Seoul City’s efforts to nurture a biotech cluster — a region or city possessing an ecosystem of strong research institutions, hospitals, venture capital investors, startups and highly-trained biomedical specialists willing to turn science into business opportunities. “By nature, the biomedical industry involves a variety of stakeholders, including researchers, financiers, medical specialists, patients, clinical trial institutions, and thus functions most efficiently as a cluster,” Seoul Bio Hub General Director Woo Jung-hoon told The Korea Herald. “And Seoul Bio Hub is at the forefront of efforts to create such a cluster in Korea. We want to eventually make Seoul Bio Hub and the Hongneung region the one-stop service stop for every business need in the biomedical business,” he said. 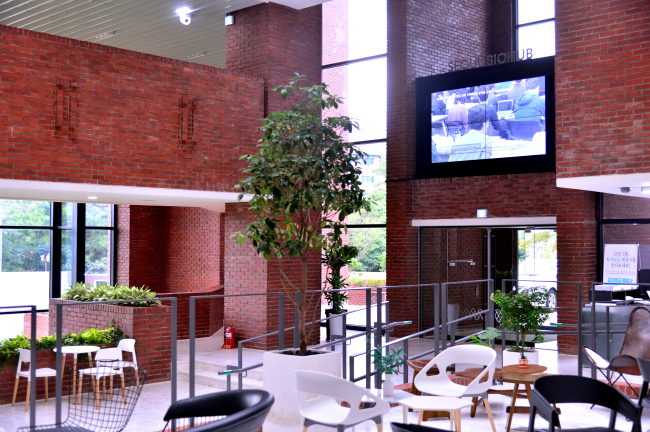 Right now, Seoul Bio Hub mainly provides strategic support to biohealth startups that are less than five years old, including customized consulting services in areas ranging from intellectual property consulting, clinical trials, regulatory approval, venture capital fundraising as well as networking events. The facility also houses the Johnson & Johnson Innovation Partnering Office, operated by J&J’s strategic venture arm, and possesses a pool of more than 200 experts in legal services, venture capital, tech commercialization and clinical trials to aid its resident startups. A total of 22 startups in biotechnology, medical devices and digital health care are currently based at Seoul Bio Hub, 20 of which were selected by Seoul Bio Hub. The remaining two are the winners of the “Seoul Innovation QuickFire Challenge,” jointly hosted by J&J Innovation, Seoul City and KHIDI. “We help startups from the fundamentals, including teaching them how to create an impactful investor presentation that includes elements VCs are looking for, such as a clear business model and exit strategy plan,” Woo said. The hub also organizes opportunities for its resident startups to market themselves out globally, via attendance at foreign trade shows and investor events. The simple fact that a startup is backed by Seoul Bio Hub is another big selling point in securing investor interest, the Seoul Bio Hub chief said. In addition to the current building, Seoul Bio Hub is planning to open a new research facility in January 2019. It will provide equipment necessary for biotech research, including chromatography instruments and real-time PCR systems, as well as 3-D printers and optical spectrum analyzers for startups designing and testing out new medical devices. Bringing research-based hospitals into the picture is also in the works. The hub is in talks with the multitude of hospitals and research institutes in the Hongneung area, including Korea University Medical Center and Kyung Hee University Medical Center, to strike equipment-sharing partnerships, Woo said. Looking ahead, Seoul Bio Hub is planning to build an open community center centered on youth startup programs in August 2019, and establish a global cooperation center housing global venture capital funds and startup accelerators by 2021. Though its primary role is incubating early-stage medtech startups, Seoul Bio Hub wants to take the lead in building a successful biomedical business ecosystem centered on Hongneung. Other biotech clusters already exist in Korea, including Songdo in Incheon, which is home to major Korean biotech manufacturing companies, and the research-oriented Osong Bio Valley in Osong, North Chungcheong Province. However, the envisioned biotech cluster in Hongneung has some advantages over its domestic rivals, including locational perks and ready access to a large pool of life sciences talent, according to the Seoul Bio Hub chief. On top of its prime location, Hongneung is also ripe with a highly-trained talent in the life sciences and biomedical business, with more than 5,000 Ph.D.s living in the area, Woo said. And the Seoul Bio Hub is pushing for programs to channel this workforce, into the realm of new technology commercialization. “We’re preparing curriculums with the medical schools in the area to give medical professionals a glimpse of Seoul Bio Hub and experience how medicine is evolving. It was sensational back when doctors began moving into the pharma industry. And now, we hope for something similar (with business innovation),” Woo said. Getting more biomedical startups and businesses to base their operations in Hongneung is another major part of Seoul Bio Hub’s cluster creation efforts. Given such, the hub is working with Seoul City to create incentives and infrastructural provisions to retain startups and businesses in this field within Hongneung, as well as convince Korea’s primary pharma and biotech associations to relocate to the envisioned cluster. “In the end, my goal is to (prove our worth) with tangible results. Looking ahead, I want to contribute to making Seoul Bio Hub and the broader Hongneung region a standout development-focused biotech cluster in Korea and across Asia,” Woo said.